Indipepper Media Pvt. 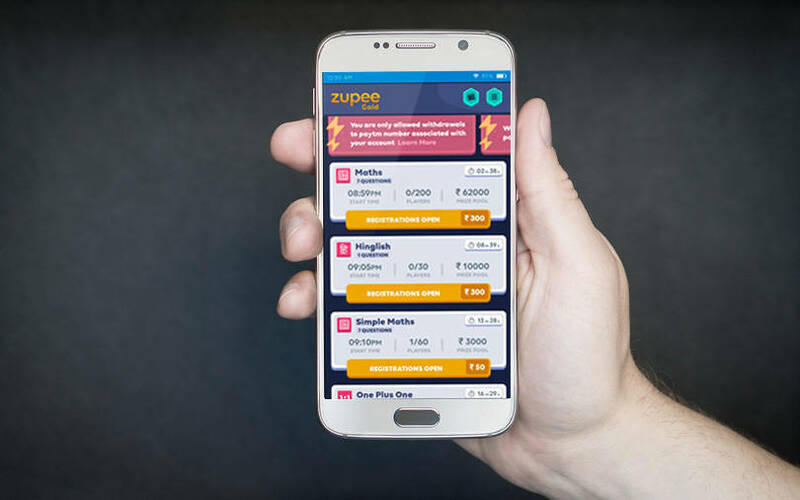 Ltd, which operates real money gaming startup Zupee, has raised a seed round of funding from Smile Group, the startup's co-founder told VCCircle. Smile Group, which owns and operates various properties in the consumer and internet media space, has invested $1 million (Rs 6.9 crore) in Zupee, said Dilsher Malhi. Zupee, which was started in May last year by Malhi and Siddhant Saurabh, will use the funds for business growth and to expand its team of 15 members. The startup, which has been incubated by Smile Group since November 2018, is a real money question-and-answer app that allows users to compete live. Users can pick any topic ranging from movies to sports and academics. Malhi said that the app has over 1 million downloads and 1.5 million gameplays per month. The games are currently available in English and the Hindi version will be launched soon. The company plans to launch in 10-12 more languages as it seeks to tap into the regional population of all ages who are fast adapting smartphones. "The reason we launched a Q&A-based gaming startup is because it has a broad appeal," said Malhi, "Above all, like in poker and fantasy games, our model also offers returns on the time spent along with the fun factor that attracts more users," he added. Zupee founders Malhi and Saurabh are alumni of the Indian Institute of Technology (IIT) Kanpur. Prior to starting the company, Malhi was a research associate at Switzerland-based EPFL (École polytechnique fédérale de Lausanne) while Saurabh was a software engineer at investment management firm Graviton Research Capital LLP. The company claims that the real-money gaming market is growing at 50-55% annually and that it is a $6-billion opportunity in India by 2025. The rise of digital gaming’s popularity in India is thanks largely to the widespread use of smartphones. Many game developers are capitalising on rising smartphone usage to build their businesses, and some have scaled up rapidly and reaped dividends for investors. On Tuesday, Dream11 Fantasy Pvt Ltd became the first unicorn in India after Hong Kong-based hedge fund Steadview Capital completed investment in the fantasy sports platform through a secondary share purchase. Renuka Ramnath-led private equity firm Multiples Alternate Asset Management and venture capital firm Kalaari Capital are likely to have earned robust returns through a partial exit from the company. Last month, Mumbai-based fantasy sports startup HalaPlay Technologies Pvt. Ltd said it raised Rs 40 crore ($5 million) in a Series A round from mobile game developer Nazara Technologies Ltd and casino gaming company Delta Corp Ltd.
Last year, Nazara acquired a 55% stake in Gurgaon-based e-sports platform NODWIN Gaming.